To celebrate the day, USAID Read Liberia has produced three Public Service Announcements that are airing in the six counties where the early grade reading activity is working. Each PSA's includes the voices of Peaches, a Hipco musician and rapper, Christopher Jackson, a football player on the Liberian National team, and Teah Dennis, also a football player on the Liberian National Team. On the recordings, the group shares why reading has been important for their successful careers and what simple actions parents can do at home to help their children to learn to read. 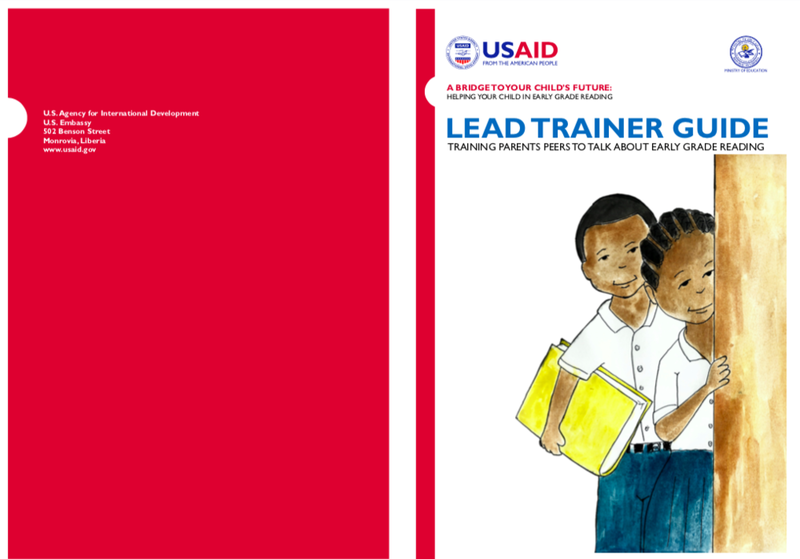 Produced by Accountability Lab in Liberia, the PSAs were approved by USAID and the Liberia Ministry of Education. Another Option is in the studios in Nepal! Our Nepal-based team, led by Prabodh Acharya, is in the recruiting studio this month to record public service announcements (PSAs) to share the importance of early grade reading in ten additional local languages, at the request of the Government of Nepal. 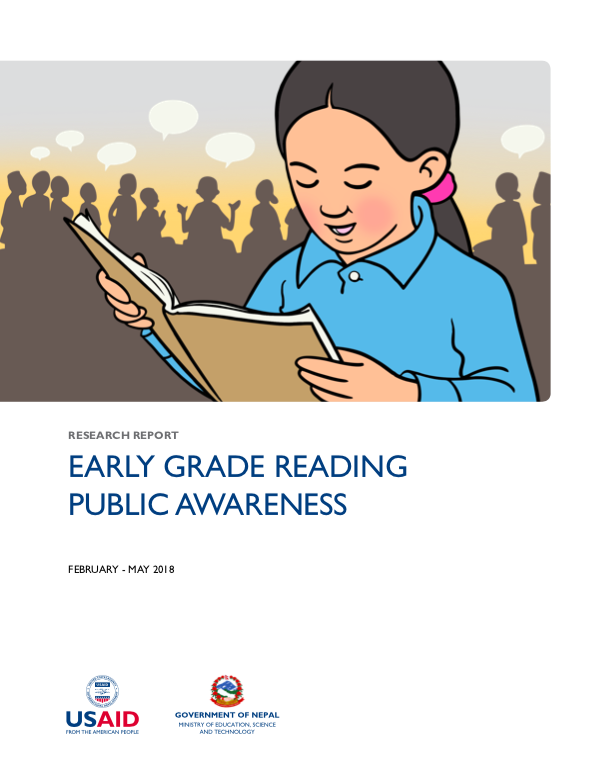 Another Option’s work in Nepal supports USAID’s Early Grade Reading Program (EGRP). The five-year, $53.8 million project supports the Ministry of Education to improve the foundational reading skills of Nepali primary school students in grades one through three. To support Another Option’s ongoing work promoting Early Grade Reading in Nepal, the Social and Behavior Change Technical team for the RTI-managed and USAID-funded project designed a national study to measure awareness of key messages and behaviors related to early grade reading. In partnership with various branches of the Government of Nepal, the study used a mixture of quantitative and qualitative methods to interview families about their beliefs and behaviors related towards reading and their children. Overall key findings identified that 57.1% parents and 81.9% teachers had listened to radio PSAs published by Another Option, and 39.1% parents and 50.5% teachers had listened to the radio program “Ramailo Padhai, Digo Sikai” (in English, Reading is Fun). Significant numbers of parents and teachers could recall key messages from the materials as well. The full report is available here for download. USAID/Nepal’s Early Grade Reading Program (EGRP) has an emphasis on Social and Behavior Change activities, including advocacy, medium mass media, radio program and media orientation. This report was prepared by EAN, a Nepal communication agency that worked with EGRP. It documents the program, which was conducted in six districts in Nepal. Another Option has been working in early grade reading for four years in Africa and Asia under several USAID-funded awards. Research shows that barriers to education, parental aspirations, and societal norms are similar across the world and do not change that dramatically—whether you are in West Africa or South Asia. As part of the USAID Early Grade Reading Program (EGRP) in Nepal, we’ve provided technical support in early grade reading Social and Behavior Change. We’ve worked closely with the Government of Nepal stakeholders including the Department of Education and the National Center for Education Development to design and develop materials for parents and caretakers, teachers, and education officers to support early grade reading. Developed resources including a peer education module for parents and an interpersonal communication toolkit for teachers to bridge communication gaps with students’ parents. In Nepal, we worked very closely with the government of Nepal to design and create all of our materials. And, we’re really pleased that the teacher training guide has been accepted by the government of Nepal as part of its national teacher training curriculum. Because the social mobilization and interpersonal communication have shown results in Nepal, we wanted to test these materials in Liberia to see if they could be adapted to the Liberian setting and its needs for our work with USAID Read Liberia. With permission from the Liberian Ministry of Education to pre-test the peer education materials, we set out to answer three critical questions: do parents understand the content (particularly the graphics and illustrations); was the guide culturally sensitive; and would it resonate with Liberian parents of young readers. We conducted an assessment with twenty-one parents-twelve women and nine men-in two communities – one urban and one rural—at Slipway Public School and King’s Farm Public School. We found that the barriers to education and aspirations were similar to parents and teachers in our Nepal-based early reading program. Parents we interviewed in both places cited factors related to economics, social norms, existing education infrastructure, and gender as real challenges in their attempts to ensure their children received a decent education. 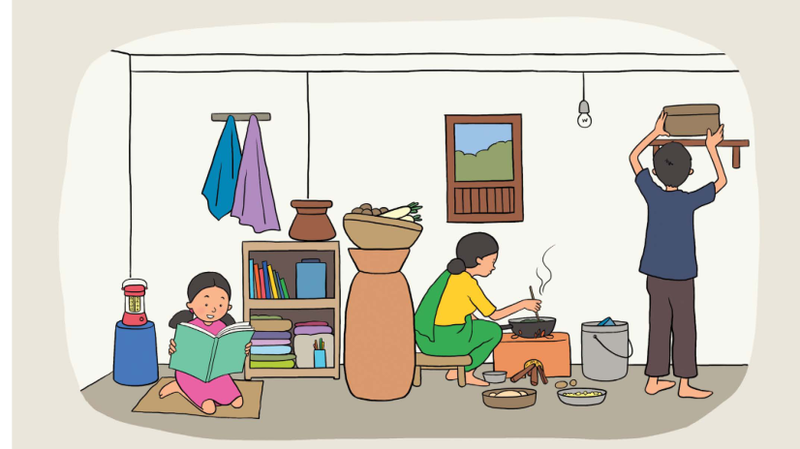 An illustration showing a girl reading to her family in a typical Nepali home. 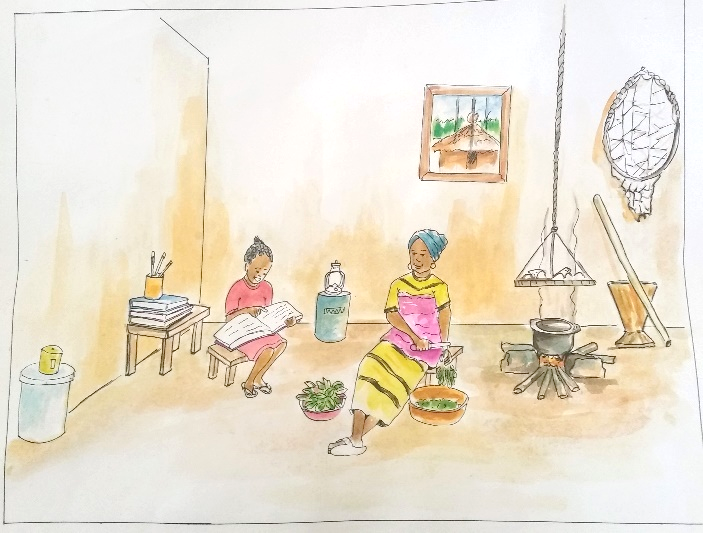 The Liberian parents overall did relate to the illustrations that were developed for Nepali parents, and that the tools were able to generate insightful discussions about the roles of parents in the reading lives of their children both in and out of school. Parents at both of our focus groups said they could see themselves and their challenges reflected in the illustrations. Parents also provided feedback on specific visual details that Another Option could do to make the resources more relatable to the Liberian context. For example, participants indicated that some of the hand gestures used in the Nepali context varied in their interpretation in Liberia and could confuse the user. They also asked for more illustrations bridging into the community and not just in the school setting to allow parents to see their roles as educators throughout their daily interactions with their children. Additionally, much discussion was held around the differences of the education setting in rural areas versus urban areas and how these could be better portrayed. Based on these responses, we worked with local illustrators to improve the cultural resonance of the illustrations in efforts to make it more relevant to parents and caregivers in urban and rural communities in Liberia. Additional materials like flyers and posters will be developed for social mobilizers to use during community engagement activities promoting early grade reading. The final Liberian version has been shared with the Ministry of Education and we have received the go ahead to test it in the field across several counties. An illustration showing a child reading to her family in a typical Liberian household. With these changes, parents will have specific examples on what they can do to help their children learn to read. These include children reading aloud for ten minutes a day, children having a quiet place to read, and regularly going to school. In both Nepal and in Liberia the support and guidance from the Ministries of Education were invaluable. The Nepal version is endorsed and carries the seal of the Ministry of Education, and we hope that the Liberian ministry also adds its endorsement to this early grade reading tool. Rebecca Martinez, who wrote this blog post, is the Program Coordinator for USAID Read Liberia. She conducted the pre-test in partnership with local counterparts on the ground in Liberia. The commitment and resolve of these statements reflect the focus of the media orientation workshop organized by the Department of Education (DOE) and the USAID-funded Early Grade Reading Program (EGRP). Held on February 6 in Kathmandu, the workshop was the first opportunity for 28 Nepali print and broadcast media journalists to come together and understand the program and their role in strengthening the program. Using presentations and group discussions, Focal Person, Bishnu Adhikari, Deputy Director, DOE and EGRP Chief of Party, Edward Graybill along with other technical team leads, shared strategic ideas about the relationship between EGRP and the government’s National Early Grade Reading Program (NEGRP). Further, participants received information packets with community mobilization and peer advocacy materials, developed and designed by the program, with the intention to facilitate better communication amongst beneficiary parents and between parents and teachers about children’s reading habit. Mr. Baburam Poudel, Director General, Department of Education welcomed the participants and opened the workshop by reiterating the critical nature of quality early grade reading and stressed all involved stakeholders to work in tandem to improve access, quality and management of primary education. Education expert, Mr. Dhananjaya Sharma called for teachers and other stakeholders in primary education to encourage two-way interactions with students and to change classroom settings to make it child-friendly among others. Special guests at the orientation included comments by Ms. Basnet, named as a CNN Hero in 2016-2017. She stressed the importance of reading in her own personal development from a shy student to a confident woman. Deputy Director Mr. Adhikari spoke at length about the National Early Grade Reading Program (NEGRP) and raised issues about program’s implementation including ownership of the program, lack of technical resources and lack of commitment of policy making and implementation. A key message that came out of the interaction between the journalists and the EGRP and the government teams was that a strong sense of camaraderie and commitment to this important work was required from all stakeholders to implant the love for reading in Nepali children from the very early grades. This blog was prepared by Adheep Pokhrel, Communication Manager for USAID/Nepal’s Early Grade Reading Program managed by RTI International. Story by Adheep Pokhrel, Communications Director, Early Grade Reading Program. Another Option is a subcontractor specializing in social and behavior change communication (SBCC) under USAID/Nepal’s Early Grade Reading Program (EGRP) managed by RTI International. EGRP operates in 16 districts in Nepal’s terai (plains) and far west regions. Targeted to parents of students in Grades 1 – 3 from minority ethnic populations and their teachers. Another Option and its research partner, GTA, conducted qualitative research among these target audiences. The qualitative research findings were used to develop messages and the SBCC strategy. A Message Development Meeting called by the Department of Education was held on February 8, 2016. What do you say to parents to encourage them to support their children in early grade reading, or to be engaged in their children’s early grade reading program? Turning correct information into memorable and effective communication messages is not as easy as it might first appear. The Department of Education and USAID’s Early Grade Reading Program (EGRP) organized a Stakeholder’s Message Development Meeting held on February 8th to develop key messages that will be used in radio advertisements, social mobilization and a communication campaign targeted to parents, teachers and key stakeholders. Representatives from the Central Line Agencies (CLA) and the EGRP communication team worked together to develop messages that combined parents’ and teachers’ personal goals with desired behaviors. The participants actively engaged in the message development session and produced a series of creative messages that reinforced positive behaviors and came in many forms, including songs, poems and rhyming verse and even a promise of a peaceful and happy life. The meeting was led by Mr. Bishnu Adhikari, Deputy Director, Department of Education. In his remarks he emphasized the role of the media and education journalists in mobilizing communities to promote early grade reading, and the need for correct messages. Through community and media mobilization, EGRP will focus on building understanding of the importance of children reading in their first language among parents and communities, as well as engaging parents and community-based organizations in evidence-based practices to support young readers. The meeting was held at the National Center for Education Development (NCED) in Bhaktapur. Participants included government officials from the Central Line Agencies (CLAs) and the EGRP communication team.